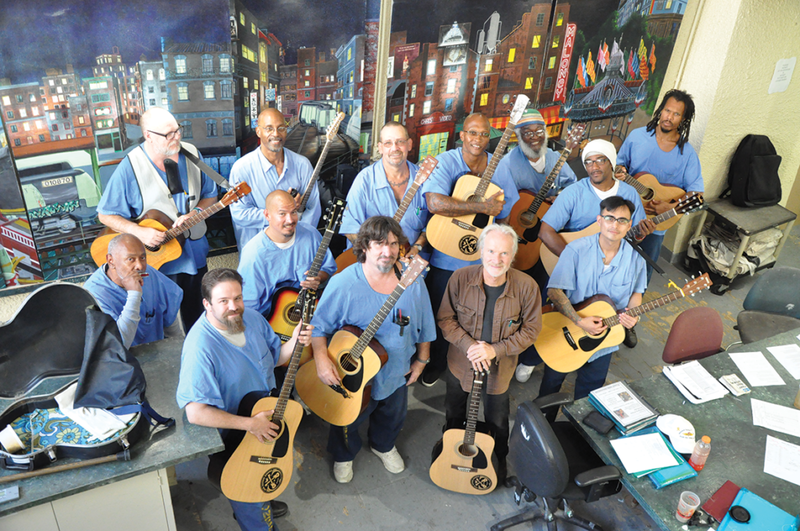 On an otherwise quiet Sunday evening, nine guitars rang out in harmony and transformed San Quentin’s Catholic Chapel into a raucous concert hall. “This was a great opportunity for us to communicate musically with no boundaries and just let our hair down,” said volunteer instructor Kurt Huget. He showcased eight emerging artists from his weekly guitar clinic as they all plucked and strummed their way through a handpicked playlist of crowd favorites. The World Series and Sunday Night Football notwithstanding, a sparse but enthusiastic audience showed up to enjoy the Oct. 28 event. The intimate performance was sponsored through Bread and Roses Presents, an organization that coordinates over 1,000 volunteer musicians with more than 50 venues each month. Starbird said that this was the first Bread and Roses performance comprised solely of inmate volunteers. She’s anxious to keep this new tradition alive at San Quentin. Several artists also braved the spotlight to sing lead vocals. Gary Harrell, a guitar student who was not performing, emerged from the front row to join in and spice up the tune with his harmonica. Huget graciously shared his mic stand so Harrell’s harp could get some amplification. McCarthy equally contributed his pipes to whistling chorus notes energetically in support of Huget’s vocals on Otis Redding’s “Sitting on the Dock of the Bay”. Thomas Washington hit all the high notes on “Under the Boardwalk”, with Johnathan Smith baritoning the title hook. Washington also sang lead on Santana’s “Black Magic Woman”, the Commodores’ “Easy”, and the Drifters’ “On Broadway”. “It’s hard to sing and play at the same time,” Washington explained after the show. “That’s something I have to work on; it was part of our repertoire in guitar class. The lone player of an electric guitar, Kevin D. Sawyer, unassumingly sprinkled twangy flavor throughout the entire performance, as well as being the featured soloist for “The Star Spangled Banner”. Huget introduced the national anthem as one of the most challenging songs for a guitarist to play. Douglas Ingham sang the only original piece of the set, describing his “San Quentin Blues” as a tune dedicated to his late wife, Jackie, who passed away in 2008. “The song was actually written for her,” stated Ingham. “I was thinking the blues would make a great old lady, but they’ll only leave you crying. He said he has written between 15 and 20 songs, some with lyrics. Ingham also took the lead for Hank Williams’ “I’m So Lonesome”. The audience jubilantly sang along and offered by far the biggest round of applause for Bob Dylan’s “Knockin’ On Heaven’s Door”. Harrell again splashed through with animated harmonica licks. Louis Calvin, Billy Dooley, and David Farber rounded out the ensemble to give the corps of acoustic guitars its full-bodied punch. Covering a total of 20 songs, the group played until it was time to vacate the chapel. The set ended with Bill Withers’ “Lean On Me”, and everyone joined in on the lyrics.